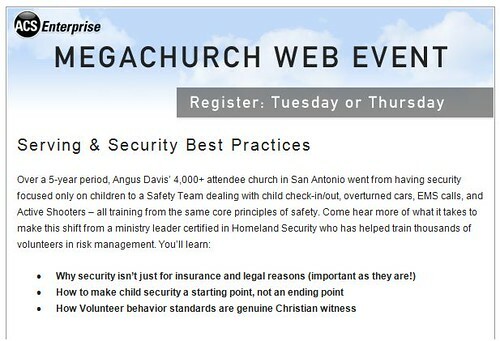 The 2012 top ten reasons to attend the Church IT RoundTable in Dallas Texas April 18th – 20th. 10. You have a project you need to finish by May 1st and don’t have a clue how to do it… nothing like 100+ free consultants to help you. 8. North Texas spring thunderstorms are awesome! 7. LAN Party (Throw back to an old school LAN party) Bring your own DEW. 6. In & Out Burger AND Chick-Fila AND Hard 8 BBQ in the same city! 5. Free Workshops on Networking/Vmware, VOIP, Wifi and Exchange. Yes I said FREE! 4. Trying out some of the cheapest most promising site to site streaming gear. 3. Building relationships with some of the most committed partners (aka vendors) serving the Church IT market who are ready to make your ministry shine. 2. Because everyone else is going.. and you’ll be sad if you aren’t. 1. Hundreds possibly Thousands of Dollars worth of training and peer learning for only the cost of admission $75! The National CITRT is one of those events that I plan to make every year… Thankfully 3.0’s release date is early March so I won’t feel TOOO guilty leaving my wife at home with a newborn and a 31/2 yr old. The Church IT Round table gatherings are a great time to reconnect with old friends, meet some great new friends and learn from some of the great minds in Church IT. I am already making my list of things I plan to learn while in Dallas. Make plans now to join us at Watermark Church in Dallas. This is going to be a can’t miss event! JUST $75 includes most meals and the event registration for the 2 days (and optional training day). Also NEW this year, we’re making a focused effort to involve Church Web/ChMS developers and integrators, this is an important group of peers to our community, so this year we are building a track for web/dev. We want our web/dev peers to benefit from an event like we have had over the past 6 years. The web/dev track will have breakout sessions to geek out about code, APIs, ChMS integrations, tools and best practices. These breakouts will be lead by web/dev heads David Drinnon (Second Baptist Houston) and Chris Kehayias (Calvary Chapel Melbourne). So go now and invite your web/dev peers on staff to join you this spring. If you only go to one training/convention/workshop this year, CITRT2012 is the can’t miss event.. CITRT2012 will make you a better IT Pro, help you build relationships with others doing the same projects you are working on, and improve the ministry you support! Admin or Not to Admin cont. If you allow Admin access you "Must" have standardization and images of each "flavor" of workstation. Does Software and Hardware get purchased Centrally? We have to digest social media for our leadership so they "get it"
Find an advocate for IT on staff… find someone who can digest Technology on your behalf.